to competing in huge events international events such as the X-Games, Gravity Games and The World Championships. Since he was 11 years old he wanted to become pro and he never looked back. In 2002 he won the Amateur vert world championships and 2003 finished the year ranked the #1 American and #4 in the World on the ASA Pro Tour. In 2006 he had to take a whole year out of skating due to surgeries on his left wrist and right shoulder. 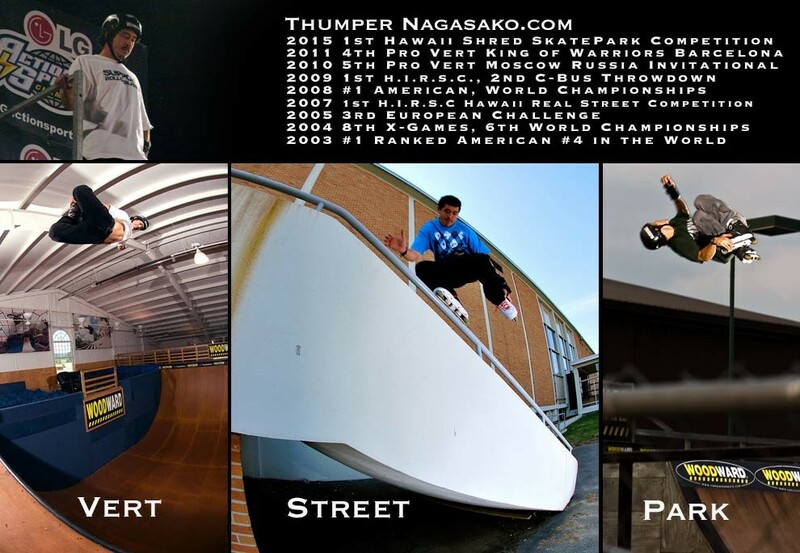 In 2008 he moved from Hawaii to Woodward, PA to further pursue his career and finished the year the #1 American on vert. He always believed in skating everything and is now pursuing pursuing park and street more seriously in additon to his vert career. In 2010 Thumper came in 5th in The Moscow Invitational on vert. 2015 he won the Hawaii Shred Skate Parks Competition. 2016 he released his first skate edit in 4 years showing at 33 he can still skate like he used to. 2018 Thumper was feature with his film on One Magazine site telling the story of his career. He is currently still skating. He does it now more for the passion than for any other reason. He also has a video production company called HI FOCUSED. Thumper says, “It’s good to be back on Maui skating where I grew up, I’ve come full circle.